Theme: The style of parenting to a great extent determines the effectiveness of the home as an evangelistic unit. 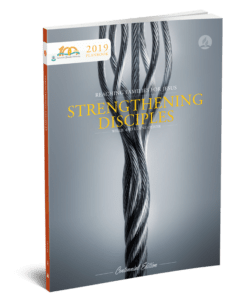 Objective: To outline a pattern for family management and home government which will have the greatest likelihood of leading children and young people to make decisions to follow Christ. How to Use This Resource: This material can be used as a short workshop for parents in any suitable setting. Presentation Helps: Ellen White made this remarkable statement many years ago: “You may be evangelists in the home, ministers of grace to your children”-Child Guidance, p. 479. There probably isn’t a parent alive who has not stood beside the bedside of a child just to watch him or her sleep. In those moments of reflection, have you ever thought of your child as a non-believer, placed by God in your home to be discipled for Jesus Christ? Have you considered how different your treatment of that child might be if you thought of yourself as an evangelist trying to win that child for God? Probably no truth is more well documented in research than the fact that the way parents manage their families profoundly affects their family’s spiritual development as well as family members’ overall formation as persons. The question of how to order a family was heavy on the minds of Manoah and his wife as they prepared for the birth of their son (Judges 13:8). In a broad-based, multicultural study by Dr. Reuben Hill, investigation was done as to why some homes produce good, self-respecting, responsible children while others produce children who are irresponsible and highly vulnerable to counter-culture activities such as drugs, alcoholism, sexual promiscuity, etc. Also, there were questions about why children in the same family differ in their choices, some making good choices while others make poor ones. On the far end of control continuum, there were some parents who simply had no control over their children at all. When they said “no,” the child went ahead and did what he or she wanted to do anyway. Even if they threatened severe punishment, the child knew from experience they would never follow through and nothing would happen, so the child did as he or she pleased. If these parents had once tried to maintain some control, they had long since given up. On the opposite end of the control continuum, Dr. Hill found high control parents. These parents were the ones who could answer the popular bumper sticker “Do you know where your kids are tonight?” with a “yes.” They made a habit of knowing where their children were at all times. Further, their children were obedient to their parents’ instruction, most of the time anyway. And if they weren’t, they knew the consequences they could expect. There was discipline, and the children learned to respect the authority of their parents. This authority was not the kind of authority which scared kids half to death that they would be beaten or grounded for weeks if they didn’t obey. It was an authority that included the children in the decision-making of the family according to their ages and gave the children reasons why they should follow the family rules. These weren’t parents who were apt to say, “You do as I say because I said it.” They were more likely to say, “I don’t want you to go and play with Johnny now because . . .” or “I’m expecting you to do this work because . . . .” Thus these parents maintained a high level of control, but they were not exhibiting the kinds of behavior which implied “You do this because I’m big enough to make you do it!” so that when their children got older they were likely to rebel. Support continuum: On the other continuum, high support parents were very good at letting their children know they loved them. There was a lot of “I’m so proud of you, son!” or “I’m so glad this girl of ours was born into this family. You’ve always been such a delight to us!” “My, it’s fun having you to mow the lawn with me,” or “What a joy it is to be able to sit here and teach you how to sew!” These kinds of parents didn’t just say these kinds of things to adults, but to their children. And they didn’t keep their warm thoughts to themselves. They were very good at support. On the opposite end of the support continuum were low support parents . This does not mean these parents did not love their children. It’s just that they weren’t very good at letting them know how much they loved them. Some had a hard time showing their love at all. Others struggled to show their love in ways that made the children feel loved. They had a hard time pushing that arm out and drawing that child close, especially when they got to be teenagers. In fact, the older the child got, the harder it got. They almost believed their boy when he said, “Aw, Mom, stop that!” when his mother reached out to hug him. They thought the boy really meant what he said, when what he really meant was “Don’t do this around my friends, Mom, because around them I’ve got to pretend I don’t like it. But it sure feels good anyway.” Parents at this end of the continuum didn’t know how to say “I love you.” If asked “When did you say ‘I love you’ to your child the last time,” they’d answer, “My child knows I love him. I’m getting his teeth straightened right now, and he’s taking trumpet lessons, and I just bought him a new bike.” Sometimes these kinds of parents confused giving love with giving things. The results to this study were most fascinating. Dr. Hill discovered that parents fit in one of four quadrants created by the intersecting of these two continuums. For example, parents who were both low control and low support were called neglectful parents. They gave their children neither support nor limits. They just let their children do as they pleased because it was easier to give up than to maintain any kind of control, and they had great difficulty expressing their love. Then there were parents who were very good at support, but still didn’t have any control. These were called permissive parents. These were parents who said, “Oh, let him do it; he’s only young once.” Or, “Does it really make that much difference whether she is allowed to do that or not?” These parents were very good at saying “You are such a good boy,” but the trouble was sometimes he was not being a good boy, but anything he did was O.K. Lots of support but no control. Another set of parents was very good at control, but very poor at support. These were called authoritarian parents. These were the parents who could snap their fingers and their children sat up and behaved. They said “don’t” and the kids “didn’t.” They said “do” and the kids “did.” These children often behaved very well until they became teenagers and started doing some things apart from their parents. When their parents weren’t there to tell them what to do, and not to do, and to force them to comply, they didn’t know how to behave. They had never learned to make choices. You can begin teaching children to make choices as early as the age of two. By that age, for instance, children can choose what to wear today, the blue shirt or the red one. Not very much hangs on a choice like that, but they do have to wear the shirt for the rest of the day and they begin to learn that the result of your choice goes with you all day long. But the authoritarian parents had not been very good at that. So when their children were faced with making choices on their own, they had no experience to fall back on. These children had also never felt their parents’ love through inclusion in the family decision-making process and responsibility as a member of the family. This, coupled with the sternness which accompanied their parents’ control, made them feel unloved. The last group of parents exhibited both high support and high control in their family management style. These parents were called authoritative parents. Don’t be confused by the similarity between the word authoritarian and authoritative as we are describing now. Authoritative means that these parents had good control, but at the same time they were very good at showing love. These children reported that they knew their parents loved them because they told them often. But they also knew certain things were expected of them, and what consequences would follow what choices. 1. They had good self-esteem. Self-esteem is the most important ingredient necessary to fortify a child against peer pressure. If a child has a good sense of personal worth, she can make her own decisions, because even if a particular group of peers turn against her, she feels good enough about herself to cope with that. In a marriage, when one or both partners don’t feel very good about themselves, you haven’t got much to work with in relationships. 2. They respected authority. Children who emerge from a home where those in authority are reasonable and where limits are coupled with kindness and much love, enter adulthood believing that the rules of society are, for the most part, just and for the best good of all. Because the essential needs of their lives have been met, and they have not been spoiled by excess, their expectations of society are reasonable. Their respect for human authority provides a natural bridge to respect God’s authority. 3. They are significantly less vulnerable to the counterculture. Their defenses are high against drugs, truancy, alcohol use, and promiscuity. 4. They are more apt to adopt the value system of their parents. These children are more likely to see their parent’s religion as winsome and as something they want for themselves as adults. Are firm, patient, loving, reasonable. Tolerate no put down or harassment at another’s expense. Maintain warm relationships with their children. Teach children to reason and make choices. Share family responsibility across family members according to age and ability. Release freedom with increasing responsibility. In small groups, talk for a few minutes about the home in which you grew up. In what ways were the 10 characteristics listed above present? absent? unpredictable? Discuss how difficult it is to break from the patterns of parenting established in your childhood home. Recall families you have watched who were moving positively toward making a reality of these characteristics in their homes. Make a list of practical how-to’s you think will help parent’s who want to grow toward these ideals. Share with the entire group. “Parents, are you working with unflagging energy in behalf of your children? The God of heaven marks your solicitude, your earnest work, your constant watchfulness. He hears your prayers. With patience and tenderness train your children for the Lord. All heaven is interested in your work. . . . God will unite with you, crowning your efforts with success.”- The Adventist Home , p. 205. “Let mothers come to Jesus with their perplexities. They will find grace sufficient to aid them in the management of their children. The gates are open for every mother who would lay her burdens at the Saviour’s feet. . . . If we will live in communion with God, we too may expect the divine Spirit to mold our little ones, even from their earliest moments.”- The Desire of Ages , p. 512. “After they [mothers] have done the best they can do for the good of their children, they may bring them to Jesus. Even the babes in the mother’s arms are precious in His sight. And as the mother’s heart yearns for the help she knows she cannot give, the grace she cannot bestow, and she casts herself and children into the merciful arms of Christ, He will receive and bless them; He will give peace, hope, and happiness to mother and children. This is a precious privilege which Jesus has granted to all mothers. . . .
“These precious words [Matthew 19:14] are to be cherished, not only by every mother, but by every father as well. These words are an encouragement to parents to press their children into His notice, to ask in the name of Christ that the Father may let His blessing rest upon their entire family. Not only are the best beloved to receive particular attention, but also the restless, wayward children, who need careful training and tender guidance.”- The Adventist Home, pp. 274-276. Campbell, Ross. How to Really Love Your Child . Wheaton, IL: Victor Books, 1977. Narramore, Bruce. Parenting With Love and Limits . Grand Rapids, MI: Zondervan Publishing House, 1979. Strauss, Richard L. How to Raise Confident Children . Grand Rapids, MI: Baker Book House, 1975. White, E. G. (1941). Christ’s object lessons. Hagerstown, MD: Review & Herald Publishing Association. White, E. G. (1940). The desire of ages. Nampa, ID: Pacific Press Publishing Association.